Pioneering is used to teach practical skills, teamwork and problem solving. It is widely used in Scouting and Girl Guiding. Many Scout and Guide groups train their members in pioneering skills and construct projects, both small and large. 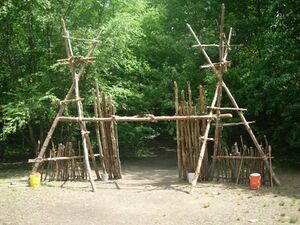 In camp, Scouts may construct functional items like tables, camp dressers and gadgets, as well as decorative camp gateways. The name comes from the 18th and 19th century military engineers who went ahead of an army to "pioneer" a route, which could involve building bridges and towers with rope and timber (for example the Royal Pioneer Corps). Pioneering skills include knotting (tying ropes together), lashing (tying spars together with rope), whipping (binding the end of a rope with thin twine), splicing (joining or binding the end of a rope using its own fibres), and skills related to the use, care and storage of ropes, spars and related pioneering equipment. A-Frame - The basis of many tower structures. The horizontal member of the A-frame also makes a convenient springing point for a deck such as a table-top. Trestle - Used as a modular element for building bridges and towers. Also used as a 'chariot' for inter-Patrol chariot races. Tripod - As end supports for swingbridges, dining tables, etc. and as the basis for the hourglass tower. A tripod is not considered secure unless its legs are staked or otherwise attached to the ground. This page was last edited on 27 December 2009, at 17:15.